Introduction: SAP HANA License keys are installed for uninterrupted usage of HANA database. You can install or delete HANA License keys using HANA studio, SAP HANA HDBSQL command line tool and HANA SQL Query Editor. 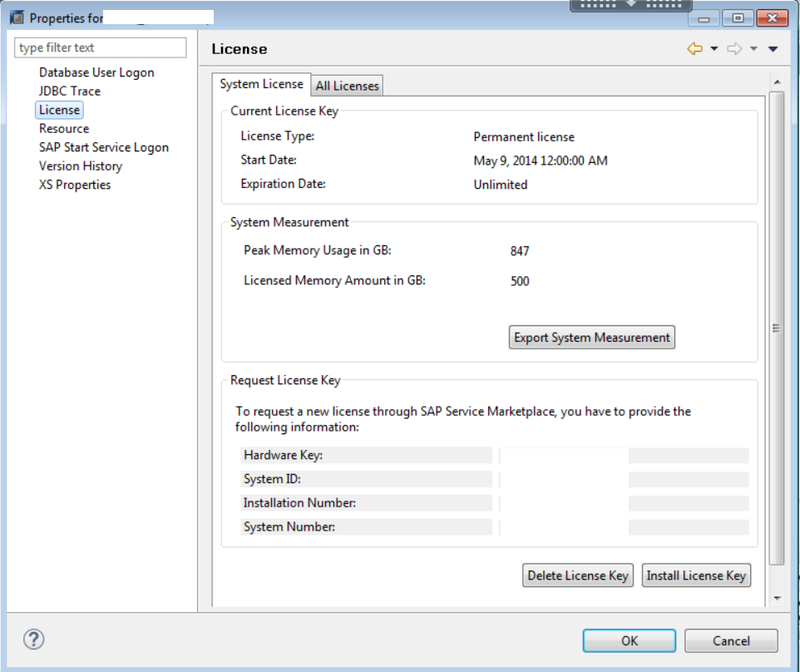 Temporary License Key − Temporary License keys are automatically installed when you install the HANA database. These keys are valid only for 90 days and you should request permanent license keys from SAP market place before expiry of this 90 days period after installation. Permanent License Key − Permanent License keys are valid only till the predefine expiration date. License keys specify amount of memory licensed to target HANA installation. They can installed from SAP Market place under Keys and Requests tab. When a permanent License key is expired, a temporary license key is issued, which is valid for only 28 days. During this period, you have to install a permanent License key again. Note: There is different License scenarios that can be used in HANA system depending on the landscape of the system (Standalone, HANA Cloud, BW on HANA, etc.) and not all of these models are based on memory of HANA system installation. License Installation: Earlier we have three different methods to install license in HANA Database. Here I am giving a brief explanation before moving ahead with new method introduced with HANA 2.0 SPS01. Install License Using SAP HANA Studio: Login to SAP HANA Studio — Right Click SID and Click on Properties Tab. You can check license details or install new license key. SAP HANA 2.0 SPS01 What’s New: With SAP HANA 2.0 SPS01 we are introduced with a new method for license installation more convenient(for end-user) using HANA Cockpit. HANA release should be HANA 2.0 SPS01 and above. 1.Login into HANA Cockpit and add HANA resources.Then click on Resources. 3. Here you can enter details for newly installed system or directly request for License Key generation for existing systems. 1. The temporary license key has expired. 2. You were using a temporary license key and the hardware key has changed. 3. The permanent license key has expired and you did not renew it within 28 days. 4. The installed license key is an enforced license key and the current memory consumption exceeds the licensed amount plus the tolerance. 5. You deleted all license keys installed in your database. In lock-down mode, no queries are possible. Only a user with the system privilege LICENSE ADMIN can connect to the database and execute license-related queries, such as, obtain previous license data, install a new license key, and delete installed license keys. In addition, the database cannot be backed up in lock-down mode. Caution: So please avoid delete all licenses unless you are sure and have business case. This made me think: I know there are license types enforced and unenforced. In the last HANA Platform Edition DBs that I installed I applied a license from the SAP Portal and it was always unenforced. Why? Because of the license model the customer owns? So actually with this license I can size the underlying systems like I want. Under which circumstances do customers get a enforced license, so they really have to watch after their memory usage? Typically in SAP, license limits are soft. Nothing happens if you exceed the amount of memory licensed. Only when GLAS initiates a license audit and it is determined that you exceeded your licensed memory amount in the past SAP will approach you and ask for more money. OK, this leads me to the next question – hope you don’t mind: Does SAP charge you by RAM-usage? This would make sense, since if they don’t, I could generate a license for, let’s say, 1 TB RAM and just use 200 GB of that. So in this case I will not overcommit my licensed RAM usage…? We are migrating several ERP, CRM, EWM, SCM, PO and Solman systems to HANA. All of them have user based licenses. Do I assume correctly the HANA licenses would be uninforced in this case so I can apply for HANA licenses just of the size we need?